My Wandering Life: We have arrived! I love the blogging app on my phone! And more than the app, I love my phone! It's amazing how small the world becomes with an iPhone. Late last night my ear started hurting and now it's throbbing with a rhythm like a high school marching band. Not good! But I travel with antibiotics and I'm hoping to kick this quickly because we've got a lot to do this week! We're spending just one night in Bangkok. We booked in a hotel which gave us an enormous suite. We could find no hotel with two queen beds or two double beds, which is suitable for a family of four. It's either one king bed or two twins. So for both our hotel tonight and the room for the rest of the week in Chiang Mai, we booked huge suites that could accommodate us. Quite the luxurious life, yes? But the nice thing is that Thailand is such an incredibly inexpensive travel destination that a huge suite is still a third of the price of a normal hotel room in Hong Kong. Stepping off the plane allowed the kids to say they've been to seven different countries in their lives. I'm a little jealous of that! Though I've been to many, many more, I didn't even leave US soil until I was 14 years old. Of course seven countries is a tiny amount compared to some of Nathan and Benjamin's peers in the international community of Macau. But you gotta start somewhere, right? 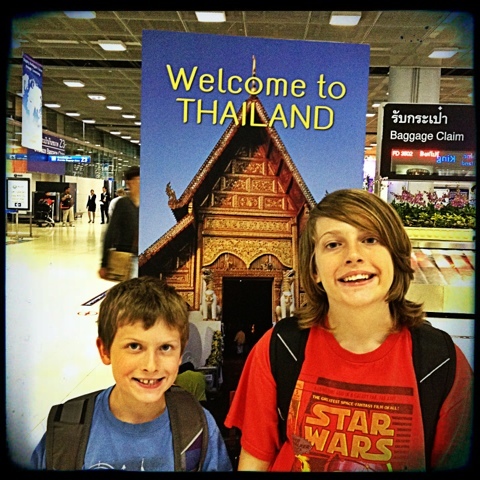 We're off to explore Bangkok! I hear adventure calling in a language I've never heard before! Wow, seven different countries? I don't think I've been to seven different states. I don't think my kids can handle that. They are too picky when it comes to eating different food. Maybe someday. Hope you have a good vacation.